This book examines popular culture in Indonesia, the world’s most populous Muslim nation, and the third largest democracy. 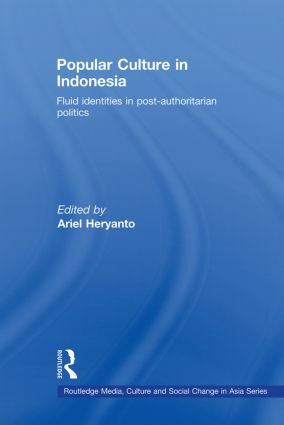 It provides a full account of the key trends since the collapse of the authoritarian Suharto regime (1998), a time of great change in Indonesian society more generally. It explains how one of the most significant results of the deepening industrialization in Southeast Asia since the 1980s has been the expansion of consumption and new forms of media, and that Indonesia is a prime example of this development. It goes on to show that although the Asian economic crisis in 1997 had immediate and negative impacts on incumbent governments, as well as the socioeconomic life for most people in the region, at the same time popular cultures have been dramatically reinvigorated as never before. It includes analysis of important themes, including political activism and citizenship, gender, class, age and ethnicity. Throughout, it shows how the multilayered and contradictory processes of identity formation in Indonesia are inextricably linked to popular culture. This is one of the first books on Indonesia's media and popular culture in English. It is a significant addition to the literature on Asian popular culture, and will be of interest to anyone who is interested in new developments in media and popular culture in Indonesia and Asia.